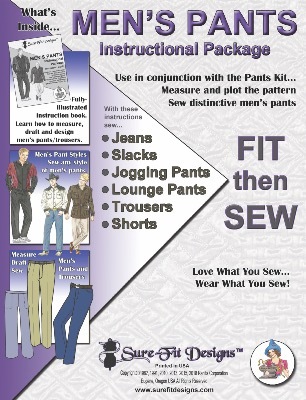 Used in conjunction with the Ladies' Pants Kit (sold separately) the Sure-Fit Designs™ Men's Pants Instructional Package guides you to create custom fit patterns to reflect the curves and contours of a man's body shape. Unique measurements are applied to the Sure-Fit Designs™ Master Patterns contained in the Ladies' Pants Kit. The resulting pattern accurately reflects a man's body shape and circumferences. With hip sizes ranging from 28" to 62" (71 -157.5 cm), it will accommodate all types of shapes. Designer Jeans, formal trousers, shorts, slim leg trousers and jogging bottoms are all possible and all reflect a man's unique body shape. Also included are instructions on adding pleats, cuffs and pockets. the Designing Stylus (curved drawing tool). This essential tool is required to draw the patterns for all of the kits and offered separately to allow customers to buy kit only options where they already own a stylus. It is also available as part of the discounted Combos. The Ladies' Pants Kit and Tracing Vellum. These are available separately. The Mens' Instructional Package, Ladies Pants Kit, Designing Stylus and Tracing Vellum are all available together as part of a discounted combo package. - see the Discounted Combo Section for great value combinations.